Ansonia Clock Co. "La Nord", Royal Bonn case stamped and signed front and back, ca 1904. Another excellent clock from the same collection. 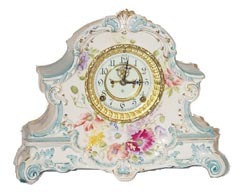 It is a big clock, standing 14 1/2 inches high, 11 1/2 inches wide. 8 day, gong strike, Rocco sash, beveled glass, 2 piece porcelain dial and open escapement. The only thing keeping me from saying this clock is perfect, are 4 faint little hairlines, which you could probably make disappear with a cleaning, or just install a replacement dial ring. It wouldn\'t bother me, just like it is, but if you are trying to collect a perfect set of Ansonia Royal Bonn\'s you will want to change the dial. Primary color is white, with a lot of light blue, rose, yellow and purple flowers, and a smattering of gold around the case edges. More flowers on top and sides than you see on most models. Complete, and a very nice Royal Bonn. Ly-Ansonia, page 607.